A few weeks ago, one of the dinosaurs at work got a little footwork done. Our dinosaur skeletons are actually not actual fossilized bones. The new era of mounting displays like this means that the actual fossils are kept elsewhere while replica bones cast off the real ones are displayed. This is much more cost effective and honestly, safer. Our display has a portion where you can actually walk underneath the belly of an Argentinosaurus. Pretty cool, but also kind of scary if you think about the thought of several tons of fossilized rock perched above your head. 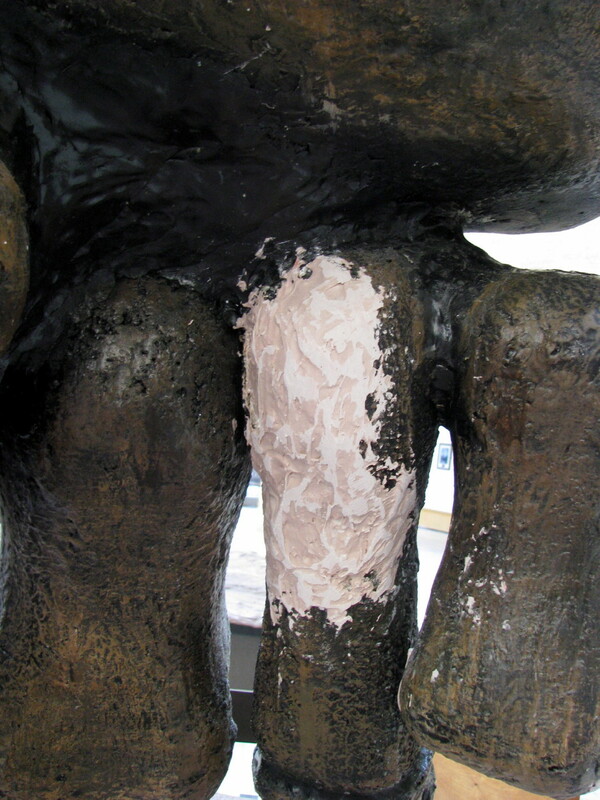 So we use casts made out of a styrofoam with an epoxy-esque, candy-like outer shell. And because you can get so close to them this means that the inevitable poking and prodding happens. Most of the time children but I have yelled at the (more than) occasional adult as well. So the museum had to have the foot repaired. At some point all of the touching had made it so the toes on the Argentinosaurus needed to be repaired. So they did. A couple of bolts and some dinosaur grade bondo later and the Mesozoic tootsies are good to go. It took about an hour and was a lot of fun. Plus, how many people get to say they ACTUALLY painted dinosaurs at work?